We are delighted to introduce you to Irvine Braces, our latest 3 1/2" Braces Boy. 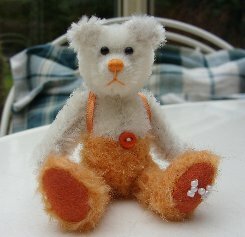 He is a sweet little chap, made of very short, ivory, velvety soft Schulte mohair whilst his trousers are made of bright orange, short tufted German mohair. His pads and paws are deep orange ultrasuede, he has bright orange ribbon braces and an orange stitched nose. We have filled Irvine Braces with steel shot to give him a nice weight for his size. He has a deep orange belly button and shiny black German glass eyes. I do hope that you like him, I think he is really sweet. He costs £39 plus postage. Please note that as with all our bears, Irvine Braces is not a toy and is not suitable for children. Sorry - Irvine Braces has been adopted.